The human eye is one of the most sensitive and accurate optical instruments known. Along with interaction with the human brain, the eye is capable of recognizing and differentiating thousands of different human faces. It can detect the smallest amount of motion in an otherwise static view. It is capable of recognizing written letters, combinations of these letters, and can formulate words, ideas and themes when these letters are formed into words, sentences, paragraphs, and books. The eye is an exquisite measurement device for color. Even the smallest differences between two different samples can be noticed. Brightness, shininess, shade and texture are all characteristics that can be detected. While this speaks well for the capability of the human eye, it presents a major challenge when formulating paints. The formulation process must be very carefully controlled to produce exactly consistent results. Even minor variations will cause differences in the finished product that will be observable, and therefore objectionable. 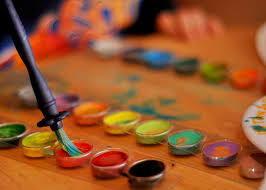 There are a number of ingredients used in paints. Different solvents are used, depending on the type of paint. Other ingredients include binders, pigments for color, and a wide variety of additional additives. Of course it is very important for the ingredients themselves to be extremely consistent. Combining the correct amounts of each of the ingredients is critical. The best way to measure each ingredient is with a precision electronic scale. Depending on the size of the batch of paint, different types of industrial scales are used. For large batches, the mixing tanks may sit on top of large floor scales. More typical applications, where 55 gallon drums of specific formulas are mixed, will sit on top of platform scales. These scales generally have capacities up to about 1000 lb. When individual pails of 1 gallon, 5 gallons or even 10 gallons are mixed, a bench scale will be most suitable. High quality digital scales, such as those manufactured by Arlyn Scales, should be used for this purpose. Most of the industrial scales available use similar strain gage technology for the scale load cell. Therefore, the good quality units will have very similar specifications for accuracy and readability. But most of the load cells used are fabricated from either aluminum or nickel plated steel. While they do not sacrifice accuracy, they are susceptible to damage from shock loads or side loads. These can easily occur in the paint formulation facility if full containers are accidentally dropped onto the scale platform. Additionally, if carts, pallet jacks or other carrying devices knock into a loaded scale platform from the side or edge, very large side thrust loads are generated. These will also damage standard load cell scales. For this reason, Arlyn Scales fabricates all of their strain gage load cells from a special alloy of stainless steel. After machining, before attachment of the electronics, the load cell is heat treated to relieve machining stresses and further harden the material. The result are load cells that are at least as accurate as the aluminum or steel cells, and are much more rugged and reliable. Although standard strain gage industrial scales are suitable for many tasks in the paint formulation process, some situations require a higher level of precision. Color pigments are usually added in very small amounts to a large quantity of base material. Even minor variations in these pigments can cause detectable changes in color. Strain gage electronic scales usually have accuracy levels specified as 1/10 of 1%. If a scale has a capacity of 100 lb, the accuracy will be 0.1 lb. If a 10 gallon pail has 80 lb of base material, it may require 1 lb of a primary pigment, and 0.1 lb of a variety secondary pigments. The standard 100 lb scale could easily vary the secondary pigments by more than 0.01 lb, or 10%. This would not be tolerable. Arlyn Scales offers the Ultra Precision SAW Scales that utilize Surface Acoustic Wave load cells for accuracy levels that are ten to twenty times more accurate then strain gage scales. These Precision Scales, with a capacity of 100 lb, has a readability level of 0.001 lb. Using this type of scale, the secondary pigments can be dispensed with accuracy levels of better than 1%. This provides final results that are suitable for the highest levels of consistency and accuracy. Furthermore, the scales are five times more tolerant of shock loads and side loads, making them suitable for use in very difficult industrial environments.